Exmobaby Suits aren't the only way to wirelessly track a person's vitals. The Creative Destruction of Medicine by Eric Topol, M.D. explores the rapidly-developing field of telemonitoring and how giving doctors instant, real-time patient-status updates can save lives and money. Capturing vital signs noninvasively with real-time wireless transmission might appear formidable. Indeed, they are typically all captured simultaneously and incessantly only in an intensive-care unit. In 2009, I was introduced to a technology that seemed remarkably futuristic. Cameron Powell, son of a Texan oil baron, and a fully trained obstetrician-gynecologist, had given up his practice of medicine to start a company known as Airstrip Technologies. Cameron's first product was known as Airstrip Ob. Most obstetricians are itinerants, serving multiple hospital facilities. Cameron's device transmitted information about an expectant mother's uterine contraction and fetal heart rate to a smart phone in real time, enabling the doctors to check on any high-risk patients regardless of distance. This app proved to be enormously popular, and tens of thousands of obstetricians started to subscribe to the service. The next field for Airstrip's technology was critical care. The vital sign data was already being captured; Airstrip's task was to reformat the data so that it could be transmitted over the Internet and displayed on a phone. By 2010, Cameron and his team obtained FDA approval and started marketing Airstrip CC. He appeared to be well on his way to becoming a wireless medicine baron of the future. The big prize was capturing the vital signs outside the intensive-care unit. The toughest nut to crack here is blood pressure; accurately measuring it on a continuous basis without placing a sensor in an artery has proven to be challenging. Matt Banet, an inventive engineer from San Diego, decided to tackle this problem around 2005. Ultimately he invented something known as the Sotera wrist transceiver sensor, which is capable of detecting arterial blood pressure, although it does require occasional calibration with an arm cuff; attachments enable measurement of blood oxygen concentration and heart rhythm. 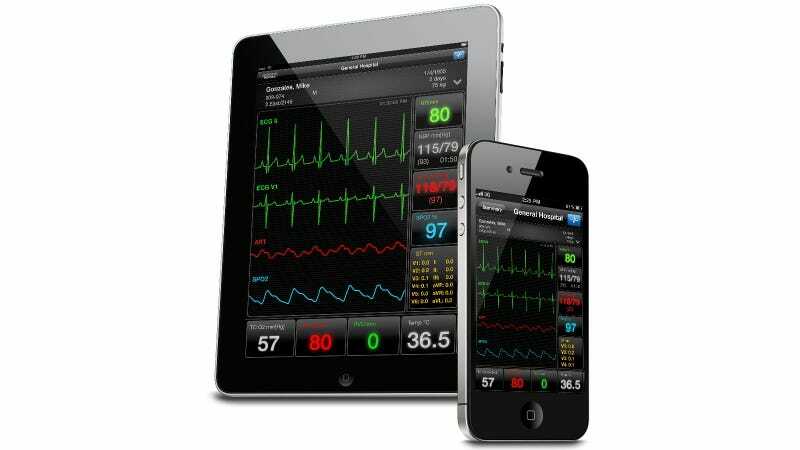 While the initial use of the Sotera device is for in-hospital monitoring, the implications go beyond one setting, making it technologically feasible today to simulate intensive-care unit monitoring anywhere. You get upset and want to know how that affects your blood pressure; you are breathing a bit heavy and want to know if your oxygenation is intact; you feel your heart flutter and want to see if you are experiencing an arrhythmia. The Sotera now makes it possible to know any of these things. It doesn't take much imagination to figure out that this is a game changer in health monitoring-or that it might create a legion of e-hypochondriacs or cyberchondriacs. While many individuals who surf the Web start believing they may have the diseases they are reading about, continuous monitoring of one's vital signs takes this concern to a new level. Nevertheless, the upside of having such information available is considerable. We know that people who weigh themselves each day rather than once per week are more successful at losing weight and maintaining their weight. Similarly, mobile phone apps that count calories have facilitated weight loss for some people. Telemonitoring of blood pressure, likewise, has been shown to have a positive impact on management. We also know that controlling blood pressure and especially avoiding marked shifts or variability are central to reducing the risk of stroke and heart attacks. Remote monitoring also avoids "white coat hypertension"-elevated blood pressure brought on by anxiety about a doctor's appointment. Such data can provide the best guidance for titrating medications, helping reveal the right doses of the right drugs for the right patient. It can also help a patient discern how changes in diet, such as a high salt load, and exercise can affect the blood pressure. The implications of having vital sign metrics are much broader than just optimal management or prevention of hypertension. Any home can theoretically be transformed into a mobile intensive-care unit, a term now used for an ambulance that provides extensive monitoring. Of course, a nurse and physician wouldn't be near at hand to provide treatment, but much of what a hospital provides for patients not in the intensive-care unit is simple monitoring-at considerable cost. Given that there are 100,000 fatalities in hospitals in the United States each year primarily as a result of patients receiving the wrong medicines, and that hospitals harbor the most serious, highly resistant bacteria and pathogens, there are some favorable trade-offs for monitoring people in their home. Responsive medical care isn't an impossibility, either. Currently, many homes are set up with alarm systems hardwired to alert the fire department and the police. The select home of the future can also be set up for continuous, real-time wireless transmission of the vital signs of its residents to the medical center. Automated processing of these signals could conceivably lead to the dispatch of an ambulance with paramedics, just the way fire fighters or police respond, and ideally without the problems of false alarms. Excerpted with permission from The Creative Destruction of Medicine: How the Digital Revolution Will Create Better Health Care by Eric Topol, M.D. Available from Basic Books, a member of The Perseus Books Group. Copyright © 2012.